Temporarily keeping the dipped headlamps on after the vehicle's ignition has been switched off makes the driver's exit easier when the light is poor. 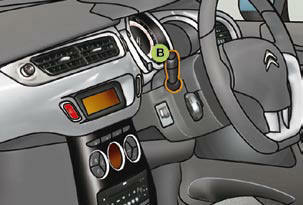 With the ignition off, "fl ash" the headlamps using the lighting stalk B . A second "headlamp fl ash" switches the function off again.